An account of a militant strike of steel workers of the Carnegie company in the US defending their organisation and conditions against the bosses, the police and hired armed mercenaries. The Robber Baron Andrew Carnegie precipitated the Homestead Strike of 1892 with his attack against the standard of living of the workers and his bid to break the union representing the highest skilled workers. Carnegie announced his intention to impose an 18 percent pay cut and issued a statement saying that the real issue was whether the Homestead steel workers would be union or non-union. He ordered a 12 foot high fence to be built around the plant – 3 miles in length – with 3 inch holes at shoulder height every 25 feet, signalling preparation for an armed fight with the workers. At the same time Carnegie hired the notorious Pinkerton company to provide armed thugs for the upcoming struggle. An ultimatum was issued for workers to accept the wage cut by June 24th or face mass layoffs. The workers did not take these provocations lightly. They were not about to abandon the union and submit to Carnegie’s dictates without a fight. The Amalgamated Union, which represented the skilled workers, about 750 of the plant’s 3,800 employees, established an Advisory Committee, comprised of five delegates from each lodge, to coordinate the struggle against Carnegie’s attacks. A mass meeting of 3,000 workers from all categories, union and non-union voted overwhelmingly to strike. The Advisory Committee took responsibility for organising an elaborate network to track the company’s manoeuvres, to monitor the possibility of an anticipated transport of Pinkerton goons by river boat from Pittsburgh. Workers rented their own vessel to patrol the river. Every road within a five mile radius of Homestead was blockaded, and a thousand strikers patrolled the river banks for ten miles. The Committee assumed virtual control of the town, assuming authority over the water, gas, and electricity facilities, shutting down the saloons, maintaining order and proclaiming ad hoc laws. An attempt by the county sheriff to move against the strikers fell flat on its face when he proved unable to raise a posse. The workers offered the sheriff a tour of the plant and promised to guarantee the security of the facility from any trespassers. Sympathy for the strikers was high. On July 5th a steam whistle sounded the alarm at 4am. Two barges transporting more than 300 Pinkertons left Pittsburgh. By the time the thugs arrived at Homestead, 10,000 armed strikers and their supporters were gathered to "greet" them. An armed confrontation erupted. Thirty workers were wounded, and three killed in the early fighting. Armed proletarians from nearby towns rushed to the scene to reinforce their class brothers. The shoot-out continued throughout the day. Finally the demoralised Pinkertons, trapped in debilitating heat on the barges, outnumbered and outgunned, mutinied against their superiors. Most were not regular agents, but reservists who had been recruited under false pretences; they were prepared to do some bullying, intimidating and terrorising, but did not have the stomach to confront armed, organised class resistance. Once the Pinkertons surrendered, the workers debated what to do with their despised prisoners. Angered by the casualties inflicted by the Pinkertons – a total of 40 wounded, 9 killed - some wanted to execute the thugs, but the Committee reasoned that a mass execution would be used against the strikers by the bosses. Instead the Pinkertons were forced to run a gauntlet. In the end the casualties suffered by the Pinkertons were 20 shot, seven killed and 300 injured running the gauntlet. In retaliation for the deaths of strikers, a young Russian anarchist called Alexander Berkman attempted to assassinate the Carnegie boss Henry Clay Frick. He shot Frick twice and stabbed him, but Frick remarkably survived. Berkman was subsequently imprisoned for 14 years. The strike continued for four months. 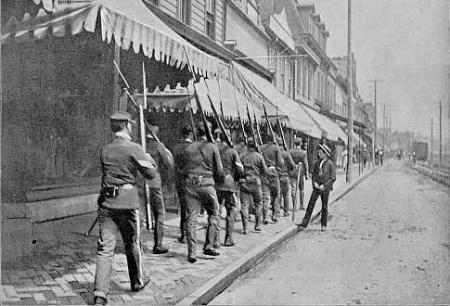 Eventually federal troops were brought in to crush the struggle, and 160 strikers were arrested and charged with murder and assault. But the bosses’ repressive apparatus could not find a jury anywhere in the Pittsburgh region that would convict a single striker. All were acquitted. Hugh O’Donnell, one of the strike leaders, was first charged with treason. Following his acquittal on those charges, he was immediately rearrested and tried for murder. And following acquittal on that charge, he was rearrested and tried for assault – again successfully beating back the state's prosecution. However, despite beating back the criminal charges, the strike morale was broken, and the union driven out. Throughout the country workers were sympathetic to the struggle at Homestead, and needless to say, the spokesmen of the capitalist class were furious. Strikers were referred to as a "mob." The New York Times granted that the company had provoked the battle, nevertheless maintained solidarity with its class brother and insisted that the obligation of the state was "to enforce law and order at Homestead, to quell the mob, to put the property of the Carnegie Steel Company in possession its owners and to protect their lawful rights." Despite ending in defeat, Homestead was an important moment in the history of class struggle in America. What happened at Homestead was not a riot. It was organised class violence, consciously controlled by the workers, as part of the struggle. Homestead demonstrated clearly the capacity of workers to organise their struggles, to resist the attacks of the capitalist class, to achieve an active solidarity in struggle, to organise their own power to rival that of the local state apparatus during the struggle, to organise class violence and exercise it judiciously. Edited and altered by libcom from an article called Historical legacy of the working class - History Demonstrates the Power of Workers’ Struggles by the International Communist Current. Does anyone know where to find a list of the strikers at the plant? My ancestors were supposedly involved in the strike, but their stories don't jive with other historical accounts.